Season 3, Episode 55 - Erin Burton Dan Sterenchuk and Tommy Estlund are honored to have as our guest, Erin Burton. Erin is a divorced mother of two living in West Des Moines, Iowa. She works as an interior designer. Aside from chasing after kids, trying to make the world a more beautiful place to live and trying to prioritize what really matters in life, she is a huge advocate for her son. He was born with a complex congenital heart defect and he has changed her life. Not only was he her first child, but he has opened her eyes to so many things in this world that she would never have paid attention to before. Her level of faith, spirituality and all around hope was transformed because of him. This isn’t really a religious transformation, more of a way of thinking and an outlook on life. Gaining perspective can be one of the most powerful realizations a person can go through. Erin, her daughter and son, have a wonderful life and they feel it is because they choose to have this perspective. 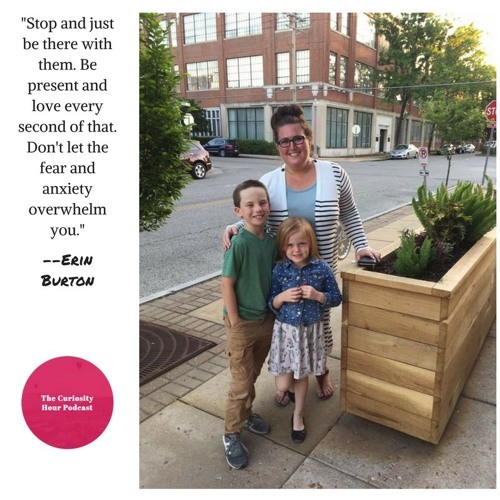 Choosing to be happy doesn’t take away worry and fear, especially when raising a child like hers, but changing perspective really does change your life. Please visit: * Help-a-heart.org * https://www.facebook.com/helpaheart2006/ Note: guests create their own bio description for each episode. The Curiosity Hour Podcast is hosted and produced by Dan Sterenchuk and Tommy Estlund. Please visit our website for more information: thecuriosityhourpodcast.com Please visit this page for information where you can listen to our podcast: thecuriosityhourpodcast.com/listen/ If you would like to share your story or have a suggested guest, please complete the "Contact us" form: thecuriosityhourpodcast.com/contact-us/ Disclaimers: The Curiosity Hour Podcast may contain content not suitable for all audiences. Listener discretion advised. The views and opinions expressed by the guests on this podcast are solely those of the guest(s). These views and opinions do not necessarily represent those of The Curiosity Hour Podcast. This podcast may contain explicit language.